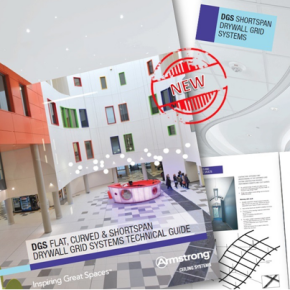 Armstrong Ceilings has introduced its Drywall Grid System (DGS) to the UK market, following its application at the Queen Elizabeth University Hospital in Glasgow, the largest ever hospital building project in Europe. Now launched in the UK, the DGS is available for use in the office, education, retail, leisure and hospitality sectors. The system can be used as a standalone, wall-to-wall, or in combination with Armstrong tiles and Axiom perimeter systems as a fully compatible solution. The suspension system is up to 40 per cent faster to install and is available in three versions: standard for typical flat installations, faceted for curved and domed ceilings of any radius, and Shortspan for smaller areas such as corridors. Designed for strength, whilst using 15 per cent less steel, the CE-marked Drywall Grid System utilises Armstrong’s T-shaped grids and can easily incorporate service elements such as light fixtures, access panels and air diffusers or ventilation systems. At the Queen Elizabeth University Hospital in Scotland, a total of 70,000 linear metres of flat and curved DGS were specified, alongside Armstrong’s bespoke pre-engineered Axiom perimeter solutions in the reception atrium and nurses’ stations. The Drywall Grid System launch is supported with a technical brochure and also features on the Armstrong website (www.armstrongceilings.co.uk) and the Ceiling Systems App available from both the Apple store as well as the Google Play store.